You’ve probably been reading/hearing about net neutrality in the recent months. Left and right, people are talking about it – either trying to push for the concept or trying to take it down. What is net neutrality anyway, and why should you bother about it? Simply put, net neutrality is a concept which places ALL web sites and services on the same level; that is, they ought to be treated as being the same by Internet service providers (ISPs) and mobile phone/cable/phone companies. You may think that this sounds logical, but telecommunications companies are leaning towards the other end of the spectrum. They think that web sites and services ought to be grouped into different categories so that they can apply various charging schemes. You getting my drift? 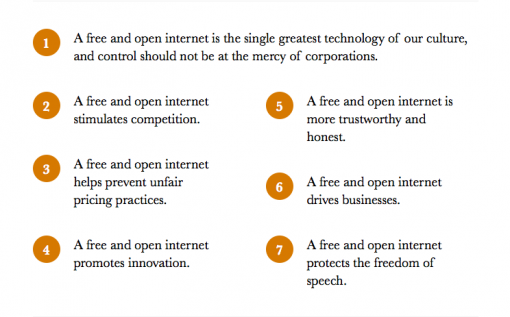 To make the whole concept easier to understand, some guys have created an excellent web site which explains the “open Internet” and what ISPs want to happen: The Open Internet. Here’s a screen shot of what a free and open Internet brings. Get the word out – share the web site and help keep the Internet free and open for all of us!